Here at the IPAT Clinic we are excited to celebrate Fair Use Week, an annual celebration of the important doctrines of fair use and fair dealing organized by the Association of Research Libraries. Because we work to support freedom of expression in the digital age, we consider fair use an important component of our practice. In fact, we work on fair use nearly every day here in the Clinic. This week, for example, we talked with several filmmakers seeking legal help so that they can make fair use in their films. And on Saturday, IPAT students Oluwatobi Agbelemose and Kristina Martinez, together with Clinic Director Jack Lerner, will be presenting on Fair Use for Academics at the annual meeting of the California Conference of the American Association of University Professors. We’ll be talking about how academics can make fair use in their scholarship appropriately, responsibly, and safely. We’ll discuss cases like Sundeman v. The Seajay Society and important tools like the Code of Best Practices in Fair Use for Scholarly Research in Communication, and make sure folks know how to use exemptions to the Digital Millennium Copyright Act that allow professors to extract content from encrypted media for teaching purposes. Stay tuned: after the presentation, we’ll update this post with our slides! UPDATE 3/2/19: Here are our slides! 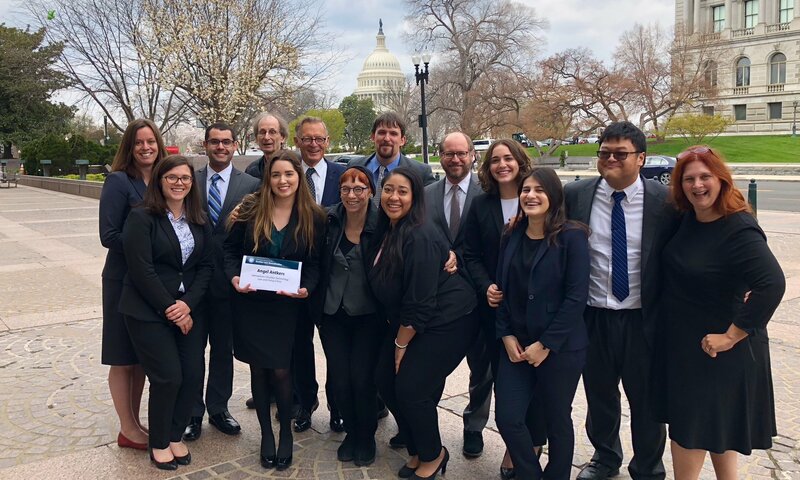 In a big win for its namesake cause, the First Amendment Team from the University of California School of Law’s Intellectual Property, Arts, and Technology Clinic successfully advocated on behalf of client Anthony Esposito, a local Bakersfield journalist, who last summer was the subject of a restrictive gag order preventing Mr. Esposito from writing or even talking about the highly publicized criminal case of People v. Perez. 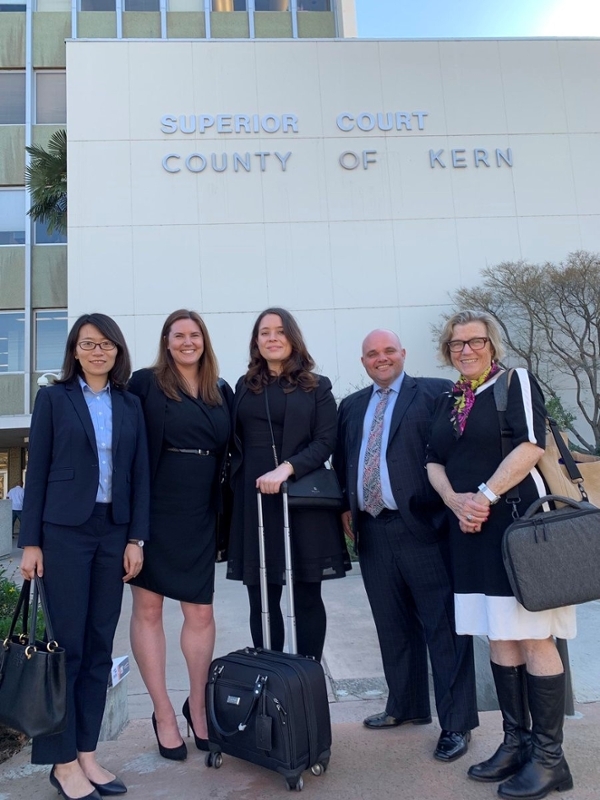 Last Friday, after oral argument by the IPAT Clinic’s Cassie Doutt, the court clarified that the gag order does not apply to Mr. Esposito and that he was free to publish stories about the case again. 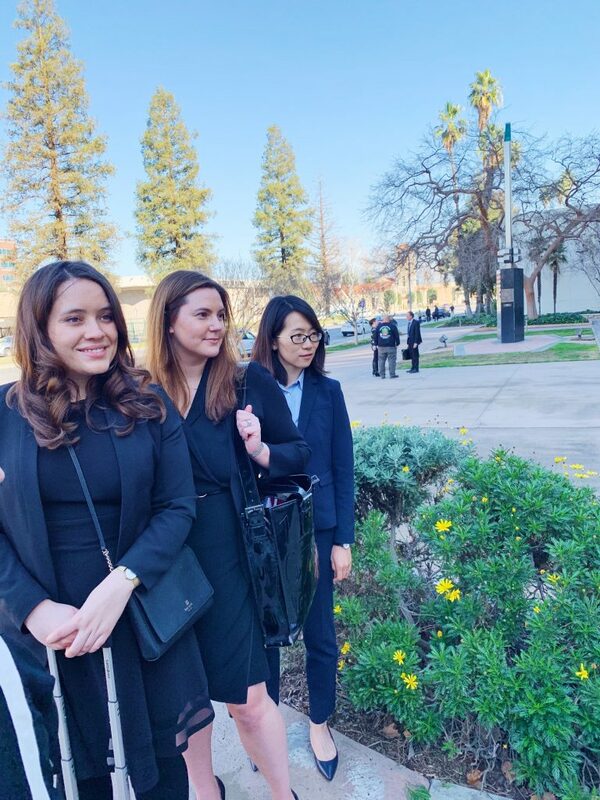 Left to Right: IPAT students Shanxi Feng, Emily Asgari, and Cassie Doutt, the clinic’s client TJ Esposito, and Professor Susan Seager. In July 2018, Bakersfield news publisher Anthony “T.J.” Esposito received a letter from the Kern County District Attorney’s office ordering him not to make any public statements about the controversial criminal prosecution of Kern County Supervisor Leticia Perez. The prosecutor told Mr. Esposito that he was gagged by the court’s Protective Order Against Publicity because Mr. Esposito was a potential witness in the Perez case, and the court had ordered all witnesses not to talk about the case. But as prosecutors would later admit, they were wrong. In fact, Mr. Esposito was not a witness. But out of fear that he would be sanctioned by the court, he stopped publishing about the case of People v. Perez for the six months following since receiving the letter. Last Friday, the all-woman student First Amendment Team made the three-hour drive from Irvine along winding highways and through pristine green farmland to the Kern County Superior Court in Bakersfield. The purpose of our journey was to persuade a judge to clarify that the court’s gag order did not apply to Mr. Esposito or to vacate the order in its entirety. 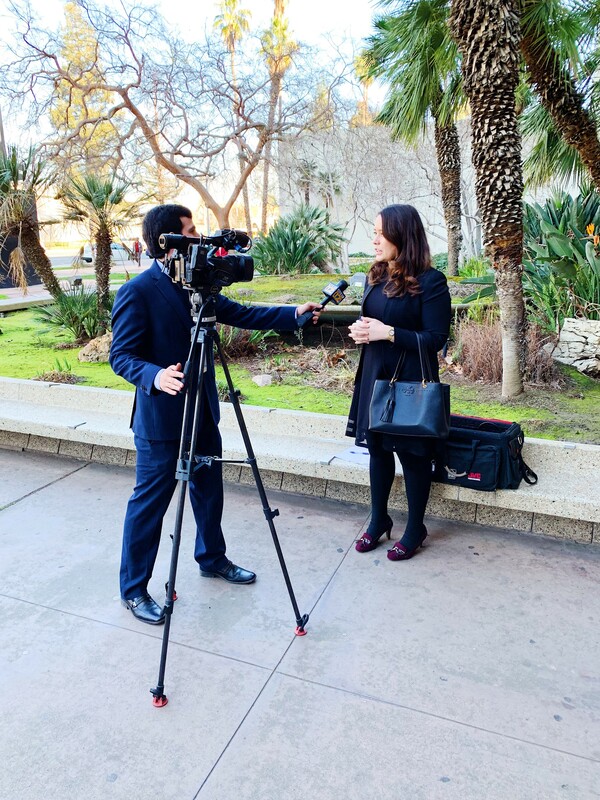 Upon entering the courtroom, the local media interest in the People v. Perez criminal case was clear, with several imposing television cameras already set up and ready to capture court-approved visual images of the hearing. At the counsel table, there was no designated seat for representative of non-parties like Mr. Esposito, but the prosecutor kindly gave up his seat at the table for Professor Seager and student Cassie Doutt. Shanxi Feng and I found seats in the front row along with Mr. Esposito. The hearing began with both the prosecution and Ms. Perez’s defense attorney, H.A. Sala, telling the judge that they had no intention of calling Mr. Esposito as a witness in the case. Judge Thomas Clark turned to Cassie, asking her why the clinic was asking him to clarify the gag order when both parties agreed Ms. Esposito was not a witness, which meant he was not bound by the gag order directed to witnesses. Upon exiting the courthouse, Cassie provided impromptu interviews to the local media in both English and Spanish. Mr. Esposito, ungagged and excited about his win, gave an interview to local NBC news affiliate KGET 17, stating, “Today was a big win for journalism and the first amendment.” Mr. Esposito then rushed to his computer and quickly posted his first story about the People v. Perez case after six months of silence. IPAT Clinic student Cassie Doutt, who argued on behalf of the clinic, answering questions in English and Spanish an interview with the local press. 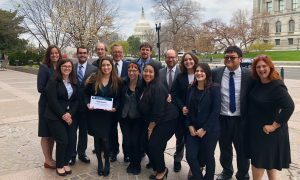 This victory is the result of nearly two semesters’ worth of student work on behalf of Mr. Esposito. Thank you to Fall 2018’s clinic students Michelle Chea, Reece Foster, Ashley Yee, and Julia Gaffney, and IPAT’s Director, Professor Jack Lerner, for their contribution to this project. The clinic is delighted to have helped further the ideals set out in the First Amendment. Guest post by Kled Baci, a Certified Law Student in the IPAT Clinic. 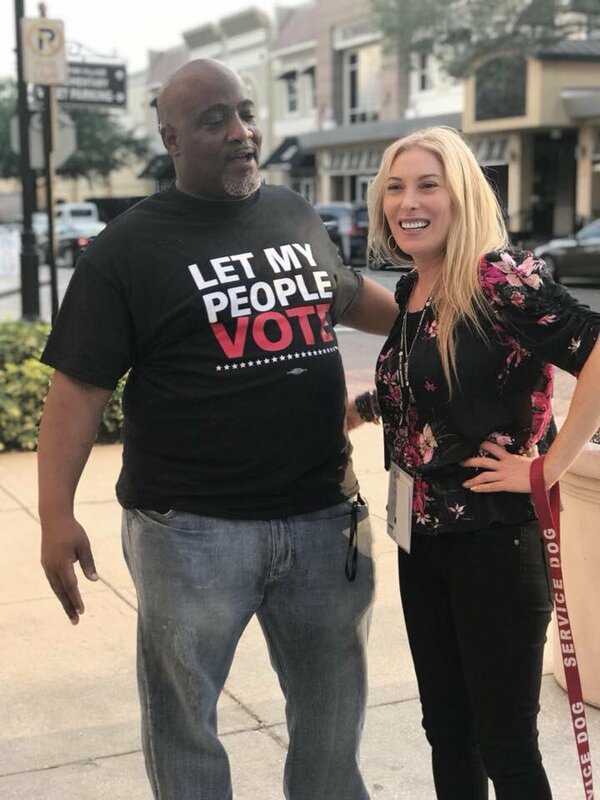 Over the past year, the UCI Intellectual Property, Arts, and Technology Clinic has begun working with nonprofit organizations dedicated to improving our election systems and fixing problems with electronic voting. 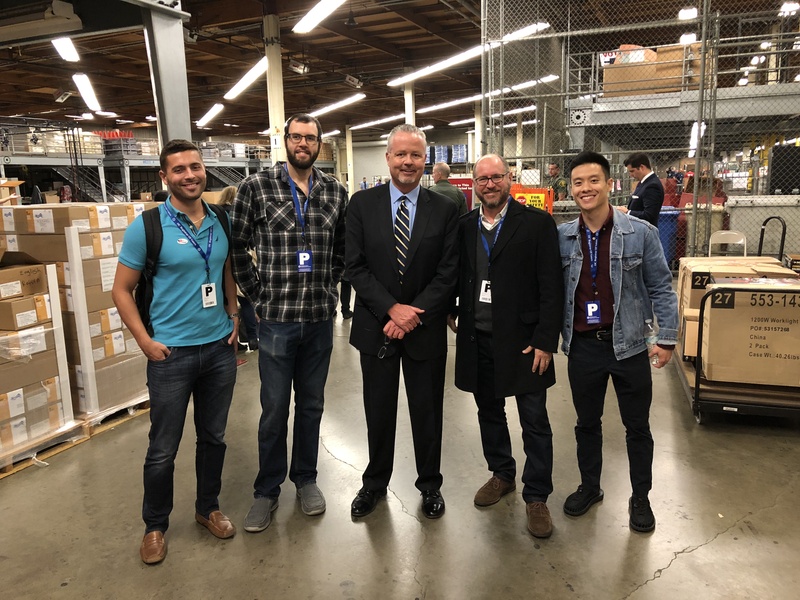 As part of that effort, on Election Night we took a trip to the Orange County Registrar’s Office to observe the ballot-counting process. We left informed—and inspired. At the Registrar’s Office, there were lines both to vote, and to register, thanks to California’s new same-day registration law. Throughout the day, we were told, each line had averaged about 300 people—enough to stretch out the building, up the stairs to the large parking lot, and all the way out nearly to the street. The atmosphere outside the Registrar’s Office was energizing. Voters stood together, shoulder to shoulder, whether young or old, in suits or sweats. Looking around, you could see and sense the support that everyday Americans were providing to one another. Both staffers and volunteers were everywhere, helping keep the lines moving. Volunteers were providing food and water to those in the lines. The level of support was uplifting and universal, especially in a time when people on both sides of the aisle often feel aggrieved. None of the support came with stipulations or party conditions—people simply wanted to help their fellow Americans exercise their right to vote. The inside of the Registrar’s Office felt like a bee’s nest. There were swarms of workers and volunteers busily keeping the logistics of the entire voting process moving along like a well-oiled machine. With almost a million ballots to be counted by the end of the evening, there was an army of staffers waiting for the boxes containing voting records from each polling place, called “Judge’s Booth Controllers” or “JBCs” by the manufacturer. 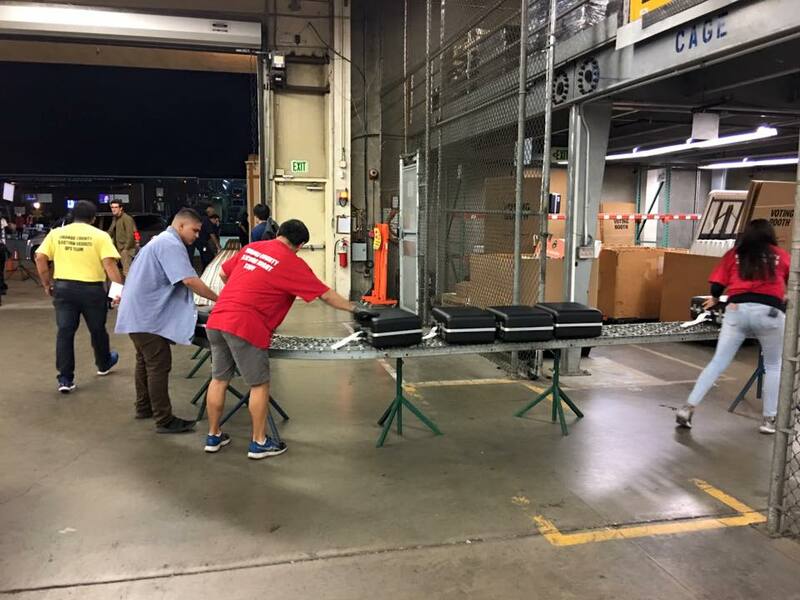 When the first of these boxes began to come in at around 9:30pm, a loudspeaker blared, “The JBCs are about to arrive” and everyone sprang into action. It was instantly clear that months of preparation had led to election night, and everyone was giving 100% to ensure things went right. As we worked our way throughout the office and adjoining facility there was a unique combination of security and transparency rarely found in any other environment. Certain areas were blocked off to the public (though we could see in) while the computer screens to those areas were projected outside so that public observers could see what was going on. Encouragingly, signs were posted listing the 200+ improvements to the voting process that have been implemented since 2014. Certainly not every improvement was earth shattering, but many—like mail-in vote tracking—seemed innovative and helpful. So many people dedicate a tremendous amount of effort to ensure Americans are able to exercise their fundamental right to vote. The process, much like our body politic, is far from perfect. A lot of work still needs to be done to improve the democracy and the voting process, and we may still be 200+ improvements away from where we need to be, but after several hours of observation, I left the Registrar’s Office with a feeling of pride and appreciation. And some free pizza.